Windows updates have always been a pain in the neck. With Windows 10, this has become even more of an issue as it gives you so little control over how Windows installs the updates. In fact, I’ve seen the Windows system reboot in between gaming sessions and stuff to install Windows updates. The upside of this behavior is that it enables users to stay up to date and enables Microsoft to add features without worrying if the user is up to date with the patches or not. Of course, this is pretty important as I’ve seen users who didn’t upgrade their systems for years. 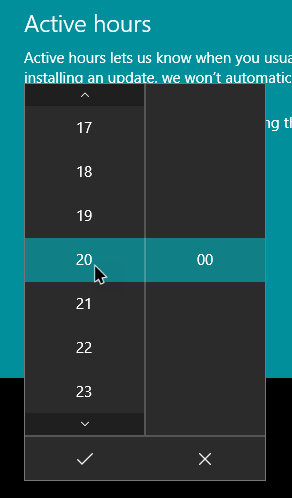 Thankfully, Microsoft added a new feature called Active Hours in the Anniversary update. Active Hours enables a Windows user to set custom timings so that Windows won’t force you to restart your system to install the updates. 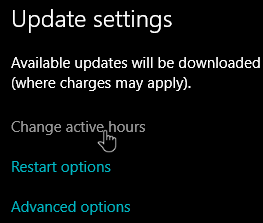 In the Update and Security window, navigate to the “Windows Update” tab in the left pane and then click on the link “Change Active Hours” under the Update Settings section. The above action will bring forward the Active Hours section. Simply set the Start and End time. In my case I’m settings my active hours from 8AM to 8PM. Do note that the start and end time should not be more than twelve hours. Once you are done setting the Active Hours, click on the “Save” button to save the changes. From this point forward, Windows won’t try to force-restart your system during the active hours. Even when you set the Active Hours, you sometimes might want to override it so that you can install the Windows update more peacefully. To override the Active Hours, you can set the custom restart time. 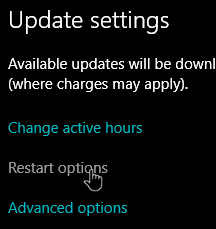 To set a custom restart time, go back to the Windows update options in the Settings app and then click on the “Restart Options” link under the Update Settings section. The above action will take you to the Restart Options screen. By default, this feature will only be available when there is a pending update installation. As you can see from the below image, I have no pending updates so I can’t use this feature. To enable custom restart time, toggle the button under the “Use a Custom Restart Time,” and set when you want to restart your system to install the updates. 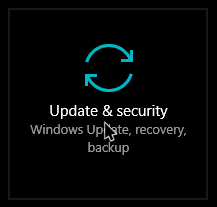 As soon as you set the restart time, Windows won’t bother you with the “Install updates” notification. Do comment below sharing your thoughts and experiences about using the Active Hours feature and the ability to set custom restart times to install the Windows updates. I volunteer for a charity. They need to use the computers between 09:00 and 21:00 but if an update is running earlier then it will continue past the active hours time. Now I quite understand that Microsoft want to improve the security of windows ( and that’s well overdue )but why do they have to restrict the active hours? 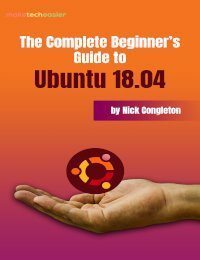 If I could set the active hours to say 07:00 to 23:00 hours I could tell the charity to leave the computers on one night each week and the updates would go ahead without bothering them. To me Microsoft just seem to try to think of new ways to aggravate their users. 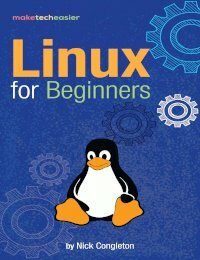 I am so glad I personally use Linux. My Win-10 PC has auto updated since loading windows 10. 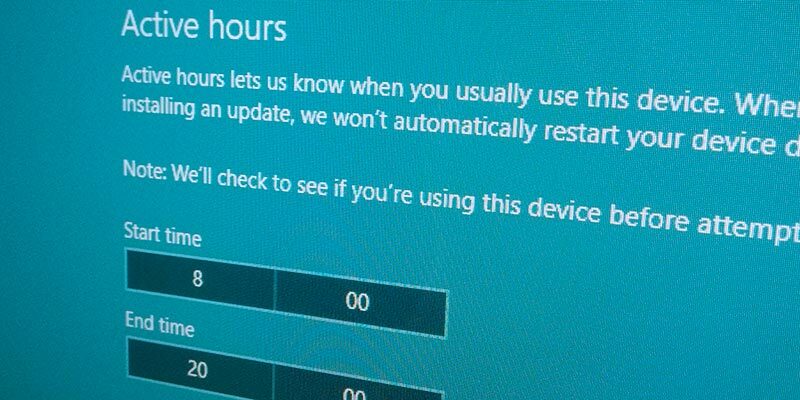 This article to “CHANGE ACTIVE HOURS” is fully useless to me as my installed win-10 PC has no “ACTIVE HOURS” settings to change, I find no search result for ACTIVE HOURS of QUIET HOURS. Are there different versions of 64 bit windows so that mine is different than your images and references in this article??? Deju-Vu….. Seems I went thru similar challenges with Windows 7, as I faintly remember writing similar questions about differing versions of windows. Splain it to me, Lucy! I had the same problem; no “Change active hours” link was visible where this article said it should be. No idea why or how this simple error got missed. Microsoft seem to be failing at QA at the moment. I HATE this change to the Active Hours setting. I use my PC CONSTANTLY throughout the day, and my active hours are FAR longer than the measly 12 Microsoft allows. 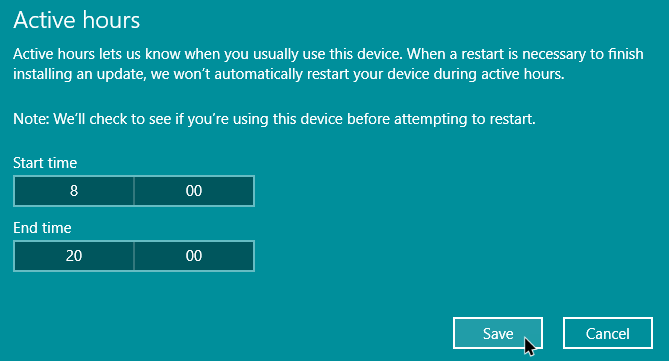 This is so incredibly stupid, I want Windows to restart when *I* want it to, not because Microsoft arbitrarily decides when I am and am not actively using my PC. Really? “Thankfully”? Are you mad, it’s disgusting. “Thankfully” is the last word I’d use. Active Hours is a pathetic cop-out. 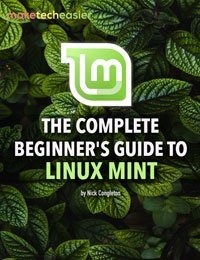 If I’m logged in with open files and software, Windows should not reboot, end of. If I want to leave a program running when I’m away for a weekend or longer, it should still be running when I get back, not subject to the whim of the operating system and some control-freak developers in California. My active time is far longer than the 12 hours it allows. My computer, my decision.